1945 (March 25): Thirty nine year old Ida Peerdeman experienced an apparition of a woman in her home in Amsterdam, and identified her as the Virgin Mary. This was to be the first vision in a series in three phases continuing up until 1959. 1950 (November 1): Pope Pius XII solemnly declared the dogma of the Assumption of Mary. 1950 (November 16): Ida understood that she was to call Mary the “Lady of All Nations.” This was the beginning of the second phase of apparitions. 1951 (February 11): A new prayer was revealed to Ida by the Lady. 1951 (4 March): Ida saw a new image of the Lady, which she was to have distributed. 1954 (May 31): The beginning of the third phase of apparitions. 1956 (May 7): Bishop Huibers of Haarlem confirmed the prohibition on public devotion to the apparitions, and announced that the diocesan investigation into the apparitions concluded that they could not be established as having a supernatural origin. 1957 (March 13): The Holy Office at the Vatican confirmed the Bishop’s position. 1959 (May 31): The formal period of the series of apparitions experienced by Ida Peerdeman ended. 1966 (February 19): The first major conference in Paris on the Amsterdam apparitions was held. 1973 (29 January): The second diocesan commission under Bishop Zwartkruis reached no new conclusions about the supernatural status of the apparitions, yet it did recommend that public devotion could be allowed. 1973 (June 12): The start of phenomena including a bleeding and weeping statue and apparitions in Akita, Japan, based upon a statue of the Lady of All Nations. 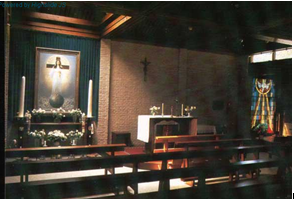 1974 (May): The Sacred Congregation for the Doctrine of the Faith advised the diocese to keep to the disciplinary measure of 1956, and thus public devotion remained prohibited. 1979 (December): The Lady of All Peoples Foundation bought a property for Ida in Diepenbrockstraat, Amsterdam, the present site of the chapel. 1984 (April 22): Bishop Ito of Niigata, Japan, recognised the supernatural character of the Akita phenomena. 1993: Vox Populi Mariae Mediatrici was founded to promote the cause for the dogma. 1995: A congregation of young nuns, the Family of Mary Co-Redemptrix, was founded. They became the custodians of the chapel. 1996 (May 31): Public devotion was finally approved by Bishop Bomers. There was no statement about the authenticity of the apparition themselves. 1996 (June 17): Ida Peerdeman, aged 90, died in Amsterdam. 1997 (May 31): The first annual International Day of Prayer in honour of the Lady of All Nations was held in Amsterdam. 2002 (May 31): Bishop Punt declared that the apparitions were considered to be of supernatural origin (constat de supernaturalite). 2004 (June 30): President Gloria Arroyo, at her inauguration, placed the Philippines under the protection of the Lady of All Nations. 2005: The Congregation for the Doctrine of the Faith, asked that the words in the Amsterdam prayer “who once was Mary” be replaced by “the Blessed Virgin Mary” to avoid misunderstanding. Ida Peerdeman (born in Alkmaar on August 13, 1905 as Isje Johanna Peerdeman, the youngest of five children) was a remarkable woman who launched a global movement of campaign for the dogma of Mary as Co-Redemptrix, Mediatrix and Advocate. [Image at right] While the classic popular understanding of visions is that the visionary is a passive medium for the communication of divine revelation, nevertheless official Catholic teaching concurs with anthropological models in attributing the content of visions to the creative and interpretive faculties of the seer herself, even where they are considered to have originated in a divine initiative (for Catholic theology on the subject, see the summary by the future Pope Benedict XVI in Bertone and Ratzinger, the Message of Fatima, 2000, and Karl Rahner, Visions and Prophecies, 1963). While the Marian titles in the proposed dogma and aspects of the prayer and image go back much further in tradition than Ida’s lifetime, no one else has stated them in this combination which has had so much impact. Thus it can be claimed that Ida Peerdeman is an important contributor to the development of twentieth century Catholic Marian devotion. She stands in a widespread European Catholic tradition of the wise woman/seer/mystic, suffering for the sins of society. The women of this type (usually older women and frequently [but not always] unmarried like Ida) are often regarded with some ambivalence by the all-male Church priestly hierarchy, but in their locality, they elicit interest, respect and devotion. They have visions and dreams; they claim to see souls in purgatory; they make prophecies about historical developments. In the 1930s, several German Catholic women seers foresaw the downfall of Hitler, and suffered the displeasure of the Gestapo in doing so. Some of Ida’s contemporaries, like Therese Neumann of Konnersreuth, Bavaria (1898-1962), Léonie van den Dijck of Onkerzele, Belgium (1875-1949), and Grete Ganseforth of Heede, Lower Saxony (1926-1996) were stigmatics. Ida did not display the visible signs of stigmata in terms of wounds or the flow of blood but she did claim to suffer the agonies of the Cross. She was highly sensitive; the short biography by Fr Sigl on the Lady of All Nations Foundation website indicates that Ida sometimes believed herself to be under demonic attack. The visions of 1945 were not the first supernatural experiences in her life; Ida claimed to have had an apparition of Mary on the same day as the miracle of Fátima (October 13, 1917), when she was only twelve. Ida’s first apparition of Mary in the series occurred at her home in Amsterdam on March 25, 1945, with her three sisters and her spiritual director, a Dominican named Fr Frehe, in attendance. The date was close to the six hundredth anniversary of the “Eucharistic Miracle of Amsterdam” (March 13, 1345), still honoured by Catholics in the city. Ida thought that the figure in her vision was the Virgin Mary and asked her whether this was true. The woman affirmed this and answered, “They will call me ‘The Lady’, ‘Mother’” (the apparitions and messages are recounted in detail in The Messages of the Lady of All Nations, published by The Lady of All Nations Foundation, Amsterdam). The Lady gave the first prophecy of several that supporters claim to have been fulfilled: the revelation of the date of the liberation of the Netherlands (May 5, 1945). The dates March 25, 1945 – August 15, 1950 comprise the first phase of apparitions, twenty three in all. Ida’s visionary messages during this period included themes such as the importance of the Cross and humanity’s rejection of it; the lack of love, truth and righteousness in the world; future disasters; exhortations to the Vatican to lead the world in dark times; the need for the Church to modernise and train priests for this task; calls to certain nations (especially England, Italy and Germany) to proclaim the Christian truth; concern about communism and the Soviet Union (following the tradition of the messages of Fátima in Portugal). The second phase of apparitions, twenty six altogether, occurred between November 16, 1950 and April 4, 1954. On November 16, 1950, the title of the woman was revealed to Ida as “The Lady of All Nations” (De Vrouwe van alle Volkeren). This followed on from the concern in previous messages for the nations of the world. During 1951, the other central concepts of the apparitions took shape, the widespread publication of which Ida stated that the Lady required. Firstly, there was a prayer, in these words: “Lord Jesus Christ, Son of the Father, send now your Spirit over the Earth; Let the Holy Spirit live in the hearts of all nations, that they may be preserved from degeneration, disaster and war. May the Lady of All Nations, who once was Mary, be our advocate; Amen.” The idea of the Holy Spirit renewing the nations of the world and bringing peace was as important to Ida in her messages as the presence of the Lady. Secondly, there was to be a new image of Mary, the Lady. In it, she stands in front of the Cross upon the globe of the Earth with rays emanating from her hands. [Image at right] This resonates strongly with traditional Marian motifs, particularly those associated with the Immaculate Conception. The globe is surrounded by black and white sheep, symbolising the peoples of the world. The image was soon afterwards given form in a commissioned painting by the German Heinrich Repke; this still hangs in Amsterdam and many copies have been made, including small prints on cards bearing the prayer. Thirdly, Ida announced a new Marian dogma that the Lady asked the Church to define. This would be the fifth and last Marian dogma (following the first four: Mother of God/Theotokos; Ever Virgin; Immaculate Conception; Assumption), but the Lady foresaw that this would be contested in the Church. It would define Mary as Co-Redemptrix, Mediatrix, and Advocate. This related to Mary suffering with the Son at the Cross. Between May 31, 1954 and May 31, 1959, the third phase of the apparitions settled into a pattern with an annual apparition on May 31, which became the day associated with The Lady of All Nations (later that year this date was designated as the feast of the Queenship of Mary by Pius XII, but since 1969, it has been allocated to the feast of the Visitation of Mary to Elizabeth). There were just seven apparitions in this phase; in addition to those on May 31 each year, there was another on Ash Wednesday, February 19, 1959, predicting the death of Pope Pius XII (he died in October). In this third phase, there was an emphasis on the Eucharist, reflecting Ida’s powerful experiences during the Mass. May 31, 1959 saw the end of the formal period of the apparitions. Nevertheless, up until the 1980s, Ida recorded occasional further experiences and messages. In the wake of public interest, the Bishop of Haarlem, Johannes Huibers, initiated a diocesan commission in the 1950s and prohibited public devotion. In 1956, he disclosed the findings of the investigation as non constat de supernaturalite, i.e. that the evidence did not necessitate a supernatural explanation for the apparitions. The Holy Office of the Vatican confirmed their support for this decision in 1957. A second commission in the 1970s came to the same conclusion, again with the support of the Sacred Congregation for the Doctrine of the Faith (which replaced the Holy Office in 1965). However, this decision did leave open the possibility of future approval. Despite the diocese’s reluctance to support or approve Ida’s apparitions, she steadily gained followers. While Peter Jan Margry (in the edited collection Moved by Mary, 2009) describes how the devotion was weak in the 1950s and relied on a small group to survive, he also shows how the international network of the Lady of All Nations took root, starting with a member of the wealthy Dutch Brenninckmeijer family helping to fund the movement and providing premises. On February 19, 1966, Marian author Raoul Auclair set up a conference in Paris on the Amsterdam apparitions, which encouraged the global promulgation of the prayer revealed by Ida in 1951. This led to the support of several bishops for the prayer, giving their imprimatur, i.e. permission for the prayer to be used in Catholic dioceses. The devotion to the Lady of All Nations spread on an international scale. In Akita, Japan, a nun, Sister Agnes Sasagawa, began to report experiences which focussed on a wooden statue of the Lady of All Nations. This statue was said to have bled from July 6, 1973 until September 29, and then wept for six years from 1975 to 1981. Sister Agnes received messages, and her experiences were authenticated by the local bishop in 1984. This is an indication of the strong support for the Lady of All Nations movement in East Asia, where devotion is especially strong in the Philippines, the country with the most derivative shrines. The extent of the global popularity of the movement of the Lady of All Nations is demonstrated by the fact that, on June 30, 2004 Gloria Arroyo, at her inauguration as president, placed the Philippines under the protection of the Lady of All Nations. In December 1979, The Lady of All Nations Foundation bought a property in Diepenbrockstraat, Amsterdam; there Ida was housed and a chapel was built that became the focal centre of the apparition cultus. The 1990s saw renewed growth in the movement. The Vox Populi Mariae Mediatrici, a global movement dedicated to the promotion of the dogma, was founded in 1993. Its most prominent spokesman has been Deacon Professor Mark Miravalle of the Franciscan University at Steubenville, Ohio, a prolific writer on Mariology and other Christian topics. The Vox Populi has petitioned the Vatican with millions of signatures, which include those of many cardinals and bishops. Then a congregation of young nuns from Austria was founded in 1995 with the title Family of Mary Co-Redemptrix, under the leadership of supporter Fr Paul Maria Sigl. They based themselves in Ida Peerdeman’s house in Diepenbrockstraat as custodians of the shrine. On May 31, 1997, the first annual International Day of Prayer in honour of the Lady of All Nations was held in Amsterdam (and subsequently, in other locations and throughout the year). These are large gatherings which attract several thousand attendees. On May 31, 1996, as Ida was dying, public devotion was finally approved by Bishop Hendrik Bomers, encouraged by the suffragan bishop Jozef Punt (apparently despite the reservations of the Dutch Bishops’ Conference). The decision meant that the cultus of the Lady of All Nations was now official. Six years later, on May 31, 2002, Bishop Punt, on the strength of a personal investigation of the original documents and consulting a new commission, declared that the apparitions were considered to be of supernatural origin (constat de supernaturalite). However, he also restated the Church caveats on apparitions, i.e. that (1) the visionary’s subjective faculties play their part in the phenomenon, so that the supernatural origin of the apparition messages and images cannot be confirmed in every detail, and (2) Catholics are not constrained to believe in apparitions even when they are approved by the Church. Ida has brought together familiar ideas in the Catholic Marian tradition during a time in which a very large sub-community of Catholics has become ever more receptive to them. This includes those who wish to re-invigorate Marian devotion because it seems to have declined since the Second Vatican Council (Vatican II). Apparitions have reinforced the importance of Mary at a time when Mariology seems to have been circumscribed within a greater emphasis on Christocentricity in the Church’s doctrine and liturgy. The impact of this change of direction has been felt more at a local rather than universal level: the papacy has not wavered in its promotion of devotion to Mary as Mother of God, but parish devotions such as processions, the rosary, and attendance at small Marian chapels have declined, in Europe and North America, at least. The proposed fifth Marian dogma includes three components: Co-Redemptrix, Mediatrix, and Advocate. Co-Redemptrix. The classic formulation of this doctrine was articulated by Edward Schillebeeck in Mary, Mother of the Redemption (1964). Redemption is achieved objectively by Christ’s incarnation and death on the Cross. The believer co-operates in her or his redemption on the subjective level by her or his faith and participation in the sacramental life of the Church. Whilst Mary is also a believer, receiving through grace like others the fruits of redemption, she is unlike other believers in that her co-operation was necessary for the incarnation to take place: she is the Mother of God who bore Christ, having assented to this at the Annunciation. Therefore, she is a participant not only subjectively in her own redemption, but also objectively in the redemption of everyone else. In 1993, Mark Miravalle wrote Mary: Co-Redemptrix, Mediatrix, Advocate promoting the dogmatic definition initiated in Ida’s visions. There Miravalle accepts that the title “Co-Redemptrix” is not found in that explicit form until the fourteenth century. However, he also argues that much earlier texts, including the New Testament and the writings of the second century apologists Justin Martyr and Irenaeus, implied belief in this title through their description of Mary’s actions and their significance. For example, Mary is the one who replies “let it be according to your word” to the message of the archangel announcing Christ’s birth, and Mary is the “new Eve” who, together with Christ as the new Adam, undoes the knot of sin with which Adam and Eve have bound humanity. Mary also suffers with Christ at the cross: Hilda Graef’s compendium, Mary: A History of Doctrine and Belief (latest edition published in 2009), traces the explicit idea of Mary as a co-sufferer with Christ on behalf of humanity back to Byzantine theologians such as John the Geometer (d. c 990). Mediatrix. This term can be understood on two levels. Firstly, at the more general level, any Christian can be referred to as a mediator or mediatrix if they act as agents in the coming to faith of others, for example through praying for them, showing them the truth of the gospel through instruction, or in practical ways that provide a Christian example. Karl Rahner, in his Mary, the Mother of the Lord (1974) shows that, while Mary is a supreme example of the Christian faith, the first to believe, what can be said of her can be attributed to all members of the Church. In this sense, Mary is a mediatrix like all Christians, i.e. an agent in the redemption of others, but not the source of that redemption. After the definition of the doctrine of the Immaculate Conception by Pius IX in 1854, other Marian teachings were considered as possible candidates for successive definitions, including the Assumption, eventually defined in 1950 by Pius XII. A campaign to define Mary as “Mediatrix of All Graces” began in 1896, encouraged by the references to Mary’s mediation in the writings of Leo XIII. Its history is recounted in Gloria Falcão Dodd’s The Virgin Mary, Mediatrix of All Grace (2012) . A Belgian Jesuit, René-Marie de la Bloise, proposed the idea and Belgian bishops, led by Cardinal Mercier, took the movement forward as it grew in the early twentieth century. The movement waned after the First World War, but it would be fair to suggest that Ida’s request for a new Marian dogma is the natural successor to the original movement with its basis in a neighbouring country. Advocate. Stephen Shoemaker’s book, Mary in Early Christian Faith and Devotion, shows that belief in Mary as an intercessor was established by the fourth century. In medieval Europe, Mary’s power to intercede on behalf of individuals, sometimes against the due process of divine justice against sinners, was celebrated in popular stories of miracles and many murals in churches. The idea of Mary’s intercession is central to the most well-known Marian prayers still important in devotion today, the Ave Maria and Salve Regina. The idea that Mary is an advocate for human beings before God is ancient, common and uncontroversial in the Catholic tradition. The Vatican II constitution on the Church, Lumen Gentium (chapter 8 on Mary), refers to Mary as “Mediatrix” and “Advocate” but not “Co-Redemptrix.” It is also careful to put the first two titles in the context of the scriptural statement that Christ is the one mediator between God and humanity. The term ‘Co-Redemptrix’, although it has a long history in the Catholic tradition, could be considered to be more likely than the others to compromise this principle. Since Vatican II, the Catholic Church has been concerned to develop ecumenical ties, firstly with the Orthodox, then with other episcopal churches such as the Lutherans and Anglicans, then all Christian denominations, and finally other religions. Any dogmatic definition that appeared to exalt Mary would have been considered unwise. No pope since Pius XII, not even that most Marian of popes, John Paul II, has been persuaded to do add to the list of Marian dogmas. The movement for the dogmatic definition of Mary as Co-Redemptrix, Mediatrix and Advocate is therefore swimming against the tide, but it is nevertheless a very large movement including senior clergy that has articulated its ideas clearly on theological and historical grounds, particularly through the organisation Vox Populi Mariae Mediatrici. Therefore, if any further dogmatic definition of Mariology is possible, it would be this one. It should be noted that Ida Peerdeman was never an opponent of Vatican II. On the contrary, she claimed to have foreseen it and some of her early messages call for a reforming of the Church to make it fitter for the task of leading the nations back to the Cross in a time of extreme danger for the world. Later on, she became nervous about the possibility of internal challenges to the centrality of the Eucharist, clerical celibacy, and some of the fundamentals of Church teaching. Nevertheless, she did not regard the Council has having reversed important Catholic doctrine, and her movement has not been anti-conciliar. The Lady of All Nations Foundation sees her as a promoter of the principles of Vatican II, anticipating them in her messages. The groups that support the Amsterdam apparitions and the call for a new dogma participate in the life of the Roman Catholic Church. There are no rituals specific to this movement. There are regular days of prayer, sometimes international in their scope. 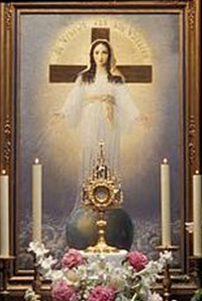 Ida Peerdeman’s most pressing concern, especially in the third phase of the apparitions, was the Eucharist. Ida lived in Amsterdam, in the diocese of Haarlem; in 2008, this diocese was renamed Haarlem-Amsterdam. Therefore, successive bishops of Haarlem were responsible for the discernment of the apparitions and, as the timeline above indicates, this has evolved from lack of certainty and support to wholehearted acceptance (although devotees claim that even bishops before Huibers came to respect Ida and her claims despite their reservations in making this public). The bishop of the diocese does have the responsibility and power to make decisions about apparitions drawing on the counsel of a commission of theologians and psychologists appointed by him. While he is well advised to consult the national episcopal conference and the Congregation for the Doctrine of the Faith in the Vatican, and usually does so, they in turn should respect his decision (the one case where this system broke down was in Medjugorje, Bosnia-Hercegovina, where, because of the bishop’s opposition against the sheer weight of support, the power of decision was transferred to the national episcopate and thence to the Vatican). Bishop Punt, the bishop who finally authenticated the apparitions of Ida Peerdeman, has a key role in the movement as the leader of the diocese in which it began and in which its primary shrine is located. [Image at right] As he has come to believe that these apparitions in his diocese are genuine supernatural charismata, then he has an obligation to support, encourage and guide the movement which follows them. The Vox Populi Mariae Mediatrici arguing for the definition of the “fifth dogma” is international in scope and its president is Mark Miravalle of the Franciscan University, Steubenville, Ohio. Its office is based in Santa Barbara, California. It has a website and many publications, both in books and audio-visual material. Ida’s movement cannot be seen in isolation from other Marian apparitions of the modern period. For many devotees, these form all of a piece, reassuring believers through many examples that Mary has come to be present with them in times of crisis; despite the warning prophecies, prayer and faithfulness would be rewarded. However, some interested parties are liable to setting up rivalries between apparition cases; many websites will extol one or more while denigrating others. One apparition is compared to others in order to cast doubt about it. Like other famous cases, for example, San Sebastián de Garabandal in Spain (1961-1965); San Damiano, Italy (1964-1981); Medjugorje in Bosnia-Hercegovina, Bosnia-Hercegovina (1981-present), Amsterdam’s apparitions have the potential to cause controversy and division. Unlike these other controversial examples, Amsterdam has gained the formal approval of the local diocese. Therefore, one challenge to Amsterdam’s visionary movement has been to suggest that the local bishop, Jozef Punt, is a maverick and that other Dutch bishops and the Vatican disapprove of him. For example, it has been claimed that Punt was influenced by Bishop Hnilica (who died in 2006), a Slovak supporter of apparitions with a questionable role and status in the Catholic Church. Opponents also point out the fact that the Vatican itself has changed the words of the original prayer, disliking the words “who once was Mary” and replacing them with “the Blessed Virgin Mary.” Surely, they suggest, if the words are unsuitable, they cannot be attributed to Mary herself? Another objection is to ask why, if the apparitions are genuine, the papacy has not responded to the call for the new dogma. Yet of course, devotees and opponents of apparitions alike misunderstand the official Church model for visionary phenomena which are “private revelations” even where they have public impact. Even where they are accepted as being of divine origin, the content of the messages and revelations is always qualified by the fact they are received through the subjective faculties of the visionary, and therefore it is the spirit of the phenomenon rather than the detail that is being authenticated, as well as the extent to which the messages refer the devotee back to the scriptural origin and central truths of Christian teaching. Unlike the latter, apparition messages never become binding; while they may be, in Catholic understanding, the visionary’s articulation of a profound encounter with a supernatural being, the perception and memory of that encounter are also considered to be affected by the subjectivity of the seer. The movement of devotion to the Lady of All Nations has suffered from an association with the heretical “Community of the Lady of All Nations” or “Army of Mary,” led by Marie-Paule Giguère in Quebec, who claimed to be an incarnation of the Virgin Mary. The Lady of All Nations Foundation and Bishop Punt strenuously deny any support for this group. There are also misleading websites such as www.ladyofallnations.org , often quoted by people researching the movement, but not an official mouthpiece of it. This website has in the past associated Ida’s messages with a future war between Christianity and Islam, projecting back the Islamophobic hysteria of the early twenty-first century onto Ida’s visions in the mid-twentieth. To conclude, the apparitions of Amsterdam have taken their place alongside others authenticated by the diocesan bishops in the nineteenth and twentieth centuries, such as Lourdes and Fátima (these are the most famous, although there are several more across the world). The messages that Ida Peerdeman of Amsterdam attributes to the Virgin Mary have an equal right to those of the visionaries at Lourdes or Fátima to be considered carefully by Catholics before being adopted or ignored. The movement supporting the papal definition of a dogma of Mary as Co-Redemptrix, Mediatrix and Advocate is one of the largest visionary campaigns in the Catholic world today, rivalling that calling for the authentication of the visions of Medjugorje (many Catholics belong to both). On the outcome of this request to the pope hangs the future direction of Catholic Mariology. Will the Church acknowledge the development of Marian tradition over centuries by declaration and definition, clarifying and strengthening its doctrinal boundaries, or will the belief prevail, held since Vatican II, that pastoral and ecumenical concerns override this and that the age of solemn pronouncement in the face of a secularising world has passed? Image #1: Photograph of visionary Ida Peerdeman. Image #2: Photograph of a painting depicting Our Lady of all Nations. Image #3: Photograph of the Our Lady of All Nations shrine in Haarlem-Amsterdam. Bertone, Tarcisio and Ratzinger, Joseph. 2000. The Message of Fatima. Vatican City: Congregation for the Doctrine of the Faith. Accessed from http://www.vatican.va/roman_curia/congregations/cfaith/documents/rc_con_cfaith_doc_20000626_message-fatima_en.html on 10 August 2016. Boss, Sarah J., ed. 2007. Mary: The Complete Resource. London and New York: Continuum. Burton, Richard E. 2004. Holy Tears, Holy Blood: Women, Catholicism, and the Culture of Suffering in France, 1840–1970. Ithaca and London: Cornell University Press. Falcão Dodd, Gloria. 2012. The Virgin Mary, Mediatrix of All Grace. Bedford, MA: Academy of the Immaculate. Graef, Hilda and Thompson, Thomas A. 2009. Mary: A History of Doctrine and Devotion, new edition. Notre Dame, IN: Ave Maria. Laurentin, René and Sbalchiero, Patrick, eds. 2007. Dictionnaire des ‘Apparitions’ de la Vierge Marie: Inventaire des Origines à nos Jours, Methodologie, Bilan Interdisciplinaire, Prospective. Paris: Fayard. Margry, Peter J. 2009. “Paradoxes of Marian Apparitional Contestation: Networks, Ideology, Gender, and the Lady of All Nations.” Pp. 183-99 in Moved by Mary: The Power of Pilgrimage in the Modern World, edited by Anna-Karina Hermkens, Willy Jansen, annd Catrien Notermans. Farnham: Ashgate. Maunder, Chris. 2016. Our Lady of the Nations: Apparitions of Mary in 20 th -Century Catholic Europe. Oxford and New York: Oxford University Press. Miravalle, Mark, ed. 1995. Mary Coredemptrix Mediatrix Advocate, Theological Foundations: Towards a Papal Definition? Santa Barbara: Queenship Publishing. Miravalle, Mark. 1993. Mary: Coredemptrix, Mediatrix, Advocate. Santa Barbara: Queenship Publishing. Rahner, Karl. 1974. Mary, Mother of the Lord. Wheathampstead: Anthony Clarke. Rahner. Karl. 1963. Visions and Prophecies (Questiones Disputatae 8–10). New York: Herder and Herder. Schillebeeckx, Edward. 1964. Mary, Mother of the Redemption. London: Sheed and Ward. Shoemaker, Stephen J. 2016. Mary in Early Christian Faith and Devotion. New Haven and London: Yale University Press. The Lady of All Nations/Family of Mary and The Lady of All Nations Foundation websites have much material in common: Accessed from http://www.de-vrouwe.info and http://www.devrouwevanallevolkeren.nl respectively (add /en for English language), both accessed on 10 August 2016. The Lady of All Nations Foundation. 1999. The Messages of the Lady of All Nations. Amsterdam. Vox Populi Mariae Mediatrici website. Accessed from http://www.fifthmariandogma.com on 10 August 2016.